The Gul 2018 GP14 World Championship at Mount’s Bay Sailing Club in Cornwall was supported by 35 sponsors and attended by over 500 sailors, family and friends. The event even had fireworks on the last night and live race tracking from Sailing Southwest. All nine race were sailed over the week despite the first day having to be abandoned due to F9 gusts. Conditions throughout the remaining sailable days were generally F3/2 with the fleet treated to a variety of different wind directions and a very unusual sea state at the beginning of the event. Tide wasn’t really a factor, so it mostly came down to getting away cleanly and being able to hold your lane. For Mike, it had been fourteen years since his last Nationals title: “It still feels a little strange to have won my first Worlds title. More job done, rather than a big ye-ha. Oddly I felt very little pressure on the last day. Chris and I agreed a plan for the last race and then just concentrated on executing it properly. “The competition was tough, if you didn’t get the first minute or so after the start right it was very difficult to pull out a counting result. The only thing the event missed was a big 20+ knot day, which we were hoping for to shake up the results. “I haven’t really felt any pressure to follow up on my last big title in 2004. I’ve been recently focusing on other things away from sailing. Perhaps this has helped me to not over think things. I also had a break from GP14 sailing for a few years in that period and I think Ian Dobson and Andy Tunnicliffe, Matt Mee and that generation came to the fore and really pushed things forwards. There was then an influx of other top sailors from Ireland such as Shane MacCarthy, Ross Kearney and Ger Owens. 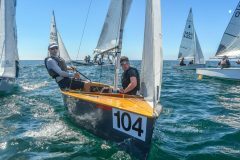 Most of the competition from the early noughties is still here competing, but the class has since become much more competitive and therefore attracting sailors from other classes to have a go. “I think the unique thing about GP14 racing is that a well-cared for 23-year-old home build such as my boat Racey’s Rocket, can compete with a brand new boat, and that an athletic teenager, those with a young family and those who are more senior, all compete on a level playing field. The weight of the boat is often moaned about, or even ridiculed, but it is also its most important part of the boat, as it means there is a wide range of competitive crew weights throughout the fleet. The boat is actually one of the most fun to sail downwind in 20+ knots, and I can say that with confidence after having lots of experience of high performance boats. It is then probably the most comfortable and tactical to sail in 10 knots. “However, the best thing about the GP14 class, and you could say why sailing in general will always be the best sport, is that after a day on the water you finish it generally with a few beers sharing stories of the what worked, what didn’t and what was funny. And then do it all again in the morning. I can’t think of any other sport like that.